If you’re one of those fabulously food-focused foodies who’s dying to know what’s going on with the Swinery — Gabe Claycamp’s bacon-biz-gone awry — I urge you to take a look at Rebekah Denn’s P.I. blog, where today she dishes the details by doing the journalistic voodoo that she does so well (and where readers have been chiming in on the subject, providing some “interesting” commentary on the chef/owner of Culinary Communion). 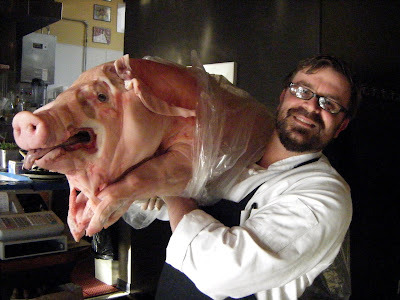 As if his day isn’t busy enough, Chet’s one of those chefs who takes his product seriously enough to buy high-quality pigs and break them down himself, turning a single 96-pounder like this fine specimen into a menu filled with pristine porcine product. The tongue? Used for head-cheese. The trotters? For stock, and smoked for soup. The neck becomes coppa; the belly, pancetta (perhaps paired with herb pappardelle). The shoulder gets confit-ified. Something you’ll appreciate, as I certainly have, when you bite into a tender barbecue pork sandwich at lunch. 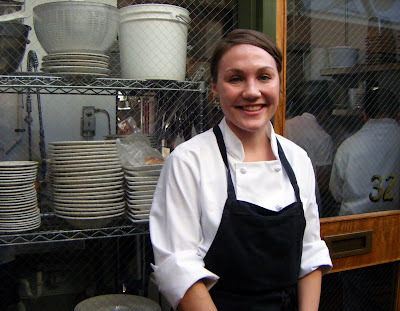 You may have seen her on “Iron Chef,” lending a hand to Brasa’s Tamara Murphy. She first came to my attention after she took top honors at the American Culinary Federation conference in Orlando in 2004 — as a 20-year-old gold-medal-winning grad from the culinary program at the Art Institute of Seattle. Since then, I’ve found her making magic behind the line at the Steelhead Diner. And after a hiatus from the rain — when she spent time in beautiful Hawaii — she’s cooked at Cremant (where Matt’s in the Market’s founding father, Matt Janke, had also been working during “the transition“). Three weeks ago Mary landed at the restaurant that bears Matt’s name, and someday I expect she’ll open an impressive restaurant that bears her own. I plan to run-don’t-walk when she does, and figure she could rightly name it Proud Mary’s. In the meantime, it’s nice to know I’ll find her at Matt’s in the Market, where there’s another Mary that always gets my attention: the perfect Bloody Mary, built by one of Seattle’s most gentlemanly bartenders, the wonderful and talented Mr. Robbie McGrath.